Le Menar is North African food with a difference. Combining core ingredients with modern cooking techniques, Chef Vernon Samuels also brings a fresh approach to presentation. Le Menar is tucked away on Cleveland Street in upmarket Fitzrovia. 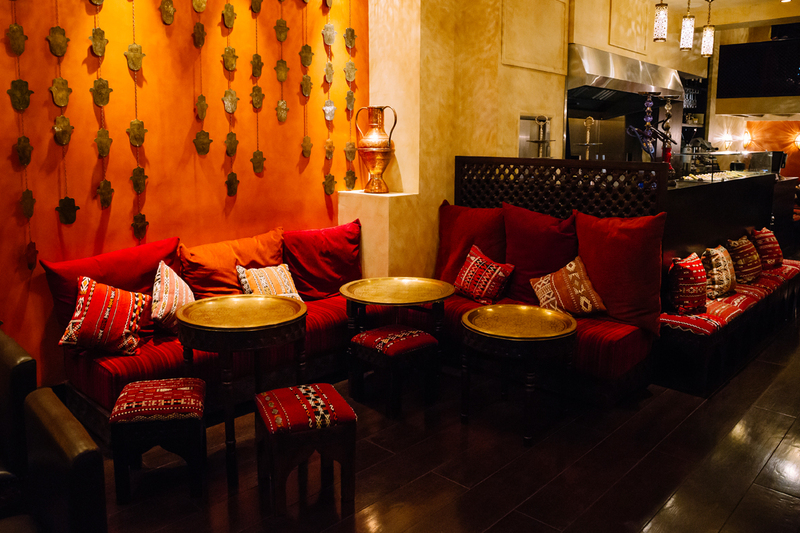 Seated at the low round Moroccan brass tables, you sink down into giant colourful pillows in a room that glows with warm tones of red and orange. The mezze sharing platter, served with delicious Lebanese flat bread, is filled with hummus, tabbouleh, baby okra salad, moutabel, falafel, moussaka, wareq enab (stuffed vine leaves) and mini kebbeh. Each element has intense flavour. The baby okra salad with pomegranate and coriander was particularly mouthwatering. The menu showed traces of Chef Vernon Samuels’ time spent working in Italy, and the Za atar burrata with heirloom tomato salad, sumac and baby basil was a fine example of this. Unable to leave a morsel of the starters, we were all-too-soon presented with our mains. The delicious Green harissa monkfish was served with batata harra (a sauce of potatoes, red peppers, coriander, chili, and garlic), samphire and tomatoes; while the slow-cooked short rib braised in a Moroccan spice mix called ras el hanout came with Jerusalem couscous and iman bayldi (aubergines stuffed with a garlic, onion and tomatoes). How we each managed to devour every mouthful is a mystery. I’ve never been to Morocco but now I surely want to eat my way around the country. Sadly, no room for dessert but when I return I’ll definitely save space for the Saffron and pistachio crème brûlée.